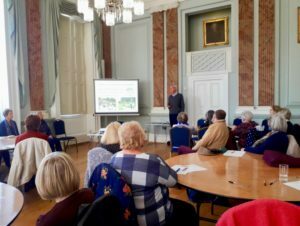 There was a big turnout for the April edition of the social gathering ‘In The Ballroom’ on Wednesday the 10th, when Tony Brown gave an illustrated talk about the Guy’s Cliffe Walled Garden. 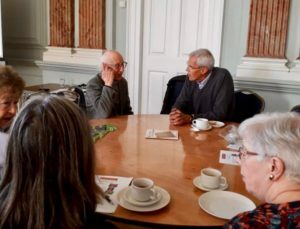 Guests heard that it was originally part of the kitchen garden supplying produce to Guy’s Cliffe House from the 1770s to the late 1940s when the house fell into decline. The walled garden became completely overgrown. Five years ago a band of local volunteers began the huge task of restoring the old garden. Now there are wheelchair-friendly paths between neat beds of fruit, vegetables and flowers, and the garden is open to the public every Wednesday, Friday and Sunday and on Bank Holiday Mondays, starting on Easter Monday. 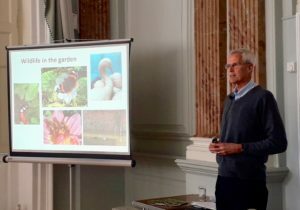 After the presentation there was the usual tea, coffee and cake, and a gardening-based quiz. 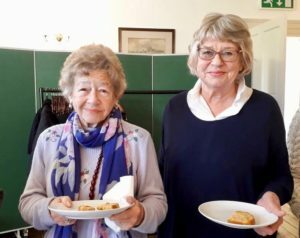 In The Ballroom takes place at the Jury Street Court House on the second Wednesday of each month between 2pm and 4pm, and costs just £2 including the refreshments. The next edition on Wednesday May 8th will feature a talk by Roger Butler about our canal network. There’s no need to book; just turn up In The Ballroom.